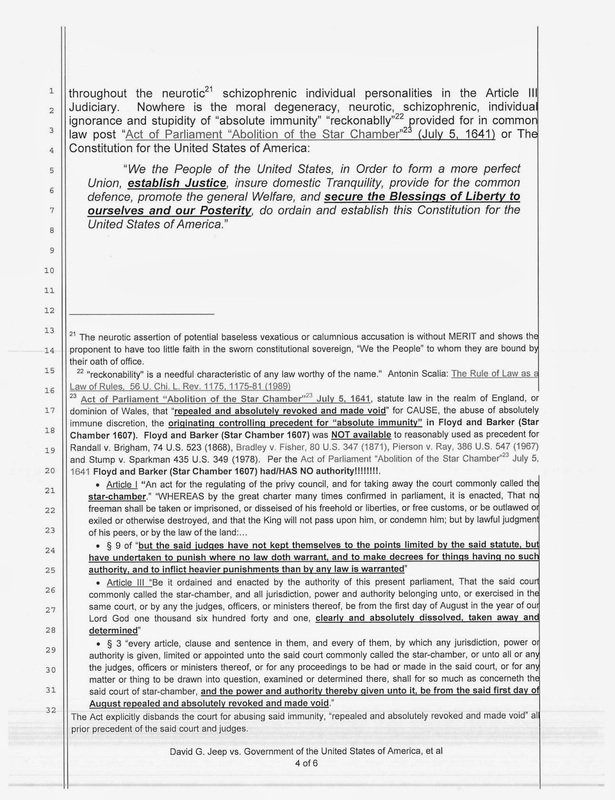 Before out of court Article III benefaction of "absolute immunity" creates absolute power to the absolute corruption of the PROTECTION of Due Process of Law. That the court refuses to see this, CONFIRMS the Article III court's distinct "sincere ignorance and conscientious stupidity." 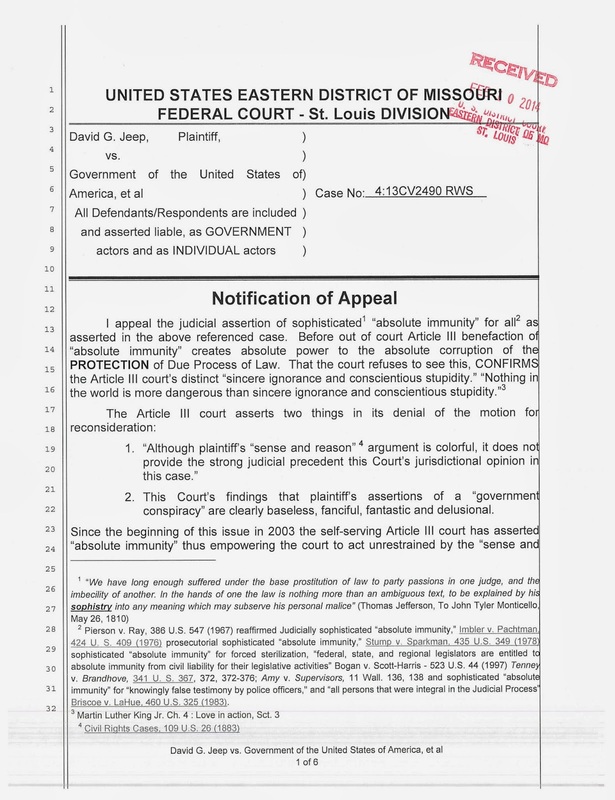 Please accept this Notice of appeal as referenced abnove and included here. 2. This Court’s findings that plaintiff’s assertions of a “government conspiracy” are clearly baseless, fanciful, fantastic and delusional. I realize I am just a SINGLE natural born citizen of the United States of America lawfully un-abridge-ably petitioning for a 1st and 7th Amendment redress of grievances, the deprivation of the constitutional “property in rights.” I stress as the Supreme Court has confirmed, “The essence of the constitutional right to equal protection of the law is that it is a personal one, and does not depend upon the number of persons affected” (McCabe v. Atchison, T. & S.F. Ry. Co., 235 U.S. 151 (1914)). 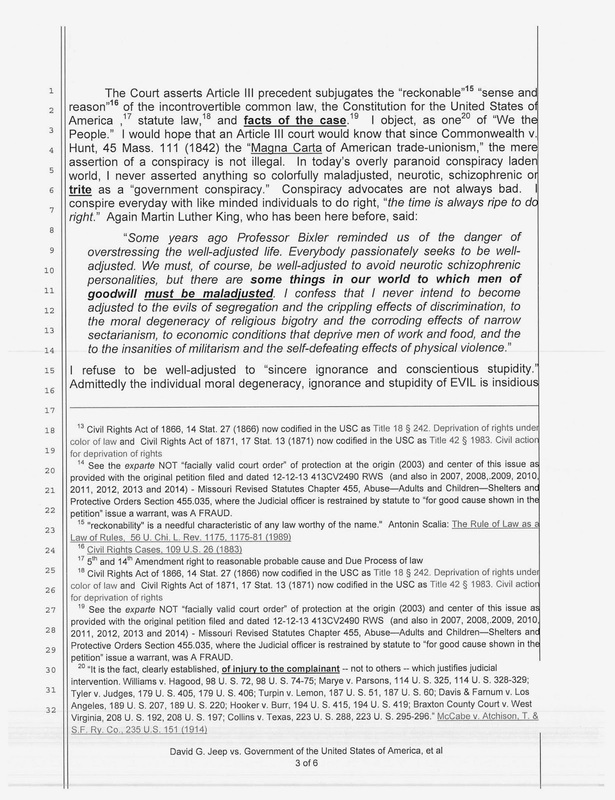 I repeat because the Article III court refuses to acknowledge the common sense of the incontrovertible constitutional common law, as Martin Luther King first said, “Nothing in the world is more dangerous than sincere ignorance and conscientious stupidity.” Clearly to any independent sane “reckonable” reading of the record, the court is sincerely ignorant and conscientiously STUPID of the incontrovertible common law, Constitutional Law, statute law, and the facts of the case. 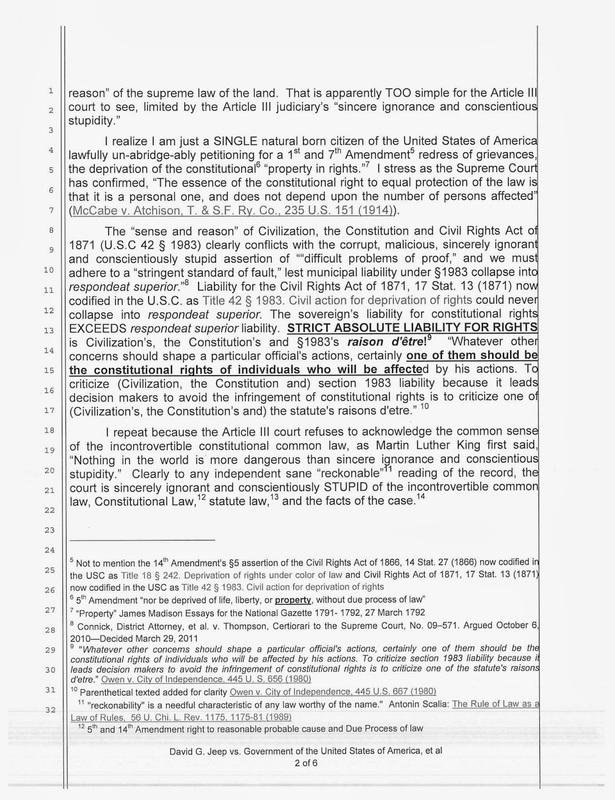 Given the clear an undisputed facts in this case, the violation of 4th, 5th, 6th, 8th, 13th and 14th Amendment rights I have a lawfully un-abridge-able 1st, 7th and 14th  Amendment right to submit the issue to a jury of my peers. Pierson v. Ray, 386 U.S. 547 (1967) reaffirmed Judicially sophisticated “absolute immunity,” Imbler v. Pachtman, 424 U. S. 409 (1976) prosecutorial sophisticated “absolute immunity,” Stump v. Sparkman, 435 U.S. 349 (1978) sophisticated “absolute immunity” for forced sterilization, “federal, state, and regional legislators are entitled to absolute immunity from civil liability for their legislative activities” Bogan v. Scott-Harris - 523 U.S. 44 (1997) Tenney v. Brandhove, 341 U. S. 367, 372, 372-376; Amy v. Supervisors, 11 Wall. 136, 138 and sophisticated “absolute immunity” for “knowingly false testimony by police officers," and “all persons that were integral in the Judicial Process” Briscoe v. LaHue, 460 U.S. 325 (1983). 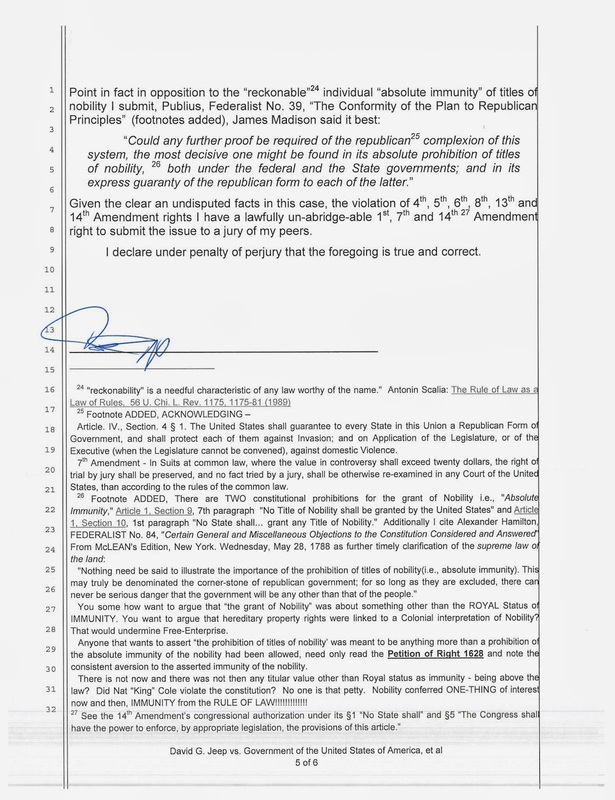 See the exparte NOT “facially valid court order” of protection at the origin (2003) and center of this issue as provided with the original petition filed and dated 12-12-13 413CV2490 RWS (and also in 2007, 2008,.2009, 2010, 2011, 2012, 2013 and 2014) - Missouri Revised Statutes Chapter 455, Abuse—Adults and Children—Shelters and Protective Orders Section 455.035, where the Judicial officer is restrained by statute to “for good cause shown in the petition” issue a warrant, was A FRAUD. The neurotic assertion of potential baseless vexatious or calumnious accusation is without MERIT and shows the proponent to have too little faith in the sworn constitutional sovereign, “We the People” to whom they are bound by their oath of office. Act of Parliament “Abolition of the Star Chamber” July 5, 1641, statute law in the realm of England, or dominion of Wales, that “repealed and absolutely revoked and made void” for CAUSE, the abuse of absolutely immune discretion, the originating controlling precedent for “absolute immunity” in Floyd and Barker (Star Chamber 1607). 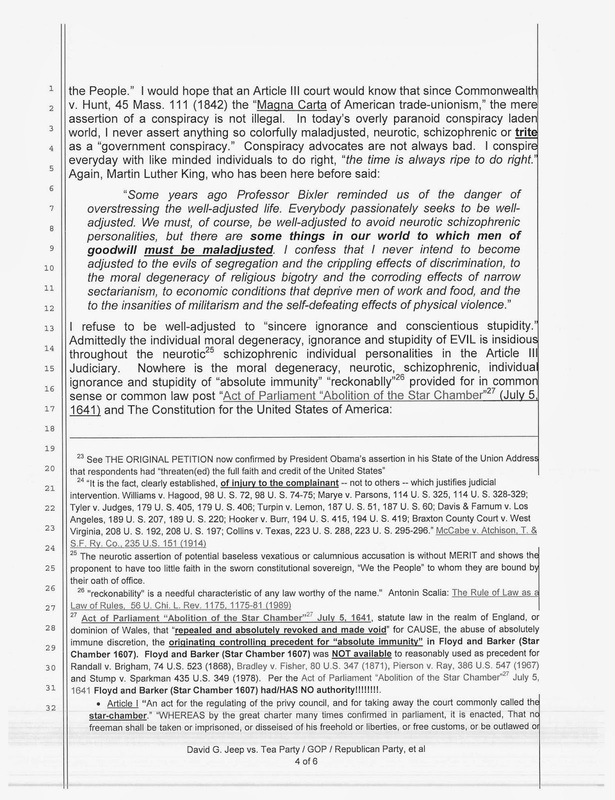 Floyd and Barker (Star Chamber 1607) was NOT available to reasonably used as precedent for Randall v. Brigham, 74 U.S. 523 (1868), Bradley v. Fisher, 80 U.S. 347 (1871), Pierson v. Ray, 386 U.S. 547 (1967) and Stump v. Sparkman 435 U.S. 349 (1978). Per the Act of Parliament “Abolition of the Star Chamber” July 5, 1641 Floyd and Barker (Star Chamber 1607) had/HAS NO authority!!!!!!!!. 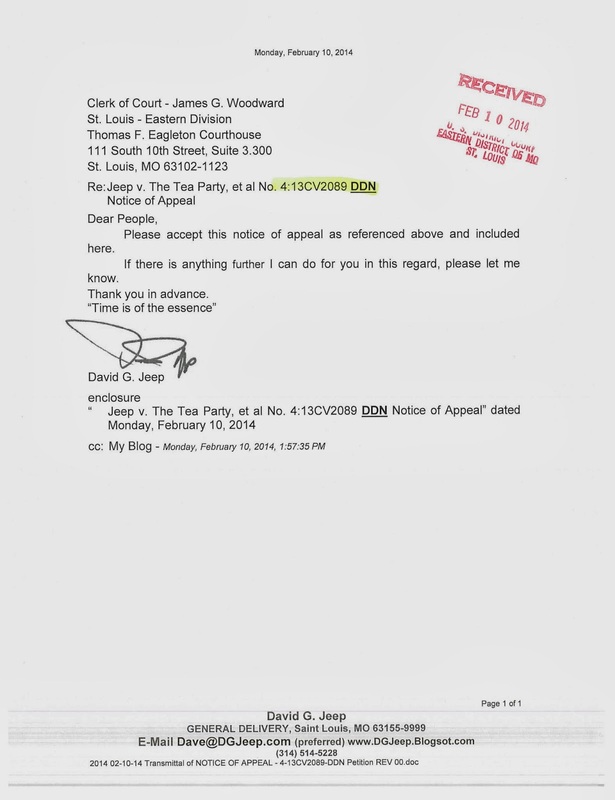 The Act explicitly disbands the court for abusing said immunity, “repealed and absolutely revoked and made void” all prior precedent of the said court and judges. Article. IV., Section. 4 § 1. The United States shall guarantee to every State in this Union a Republican Form of Government, and shall protect each of them against Invasion; and on Application of the Legislature, or of the Executive (when the Legislature cannot be convened), against domestic Violence. 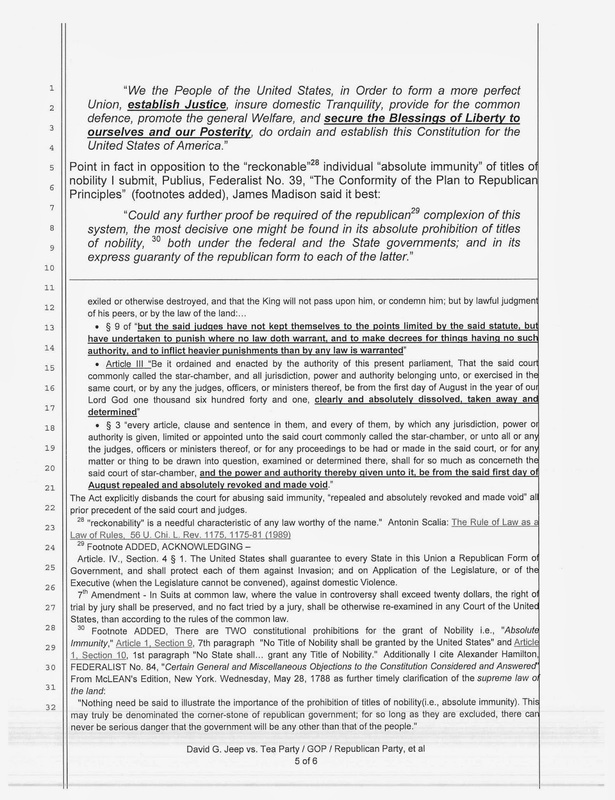 7th Amendment - In Suits at common law, where the value in controversy shall exceed twenty dollars, the right of trial by jury shall be preserved, and no fact tried by a jury, shall be otherwise re-examined in any Court of the United States, than according to the rules of the common law. Anyone that wants to assert “the prohibition of titles of nobility’ was meant to be anything more than a prohibition of the absolute immunity of the nobility had been allowed, need only read the Petition of Right 1628 and note the consistent aversion to the asserted immunity of the nobility. There is not now and there was not then any titular value other than Royal status as immunity - being above the law? Did Nat “King” Cole violate the constitution? No one is that petty. Nobility conferred ONE-THING of interest now and then, IMMUNITY from the RULE OF LAW!!!!!!!!!!!!! 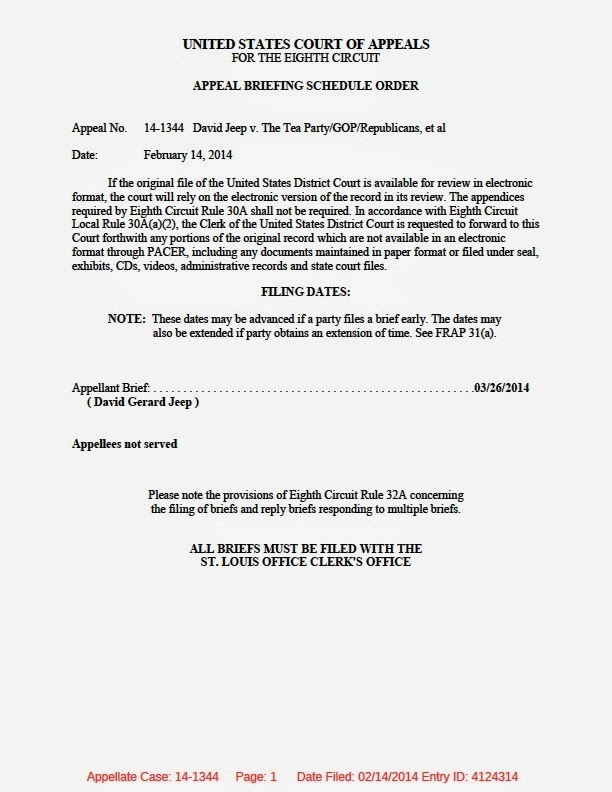 Please accept this notice of appeal as referenced above and included here. 1. 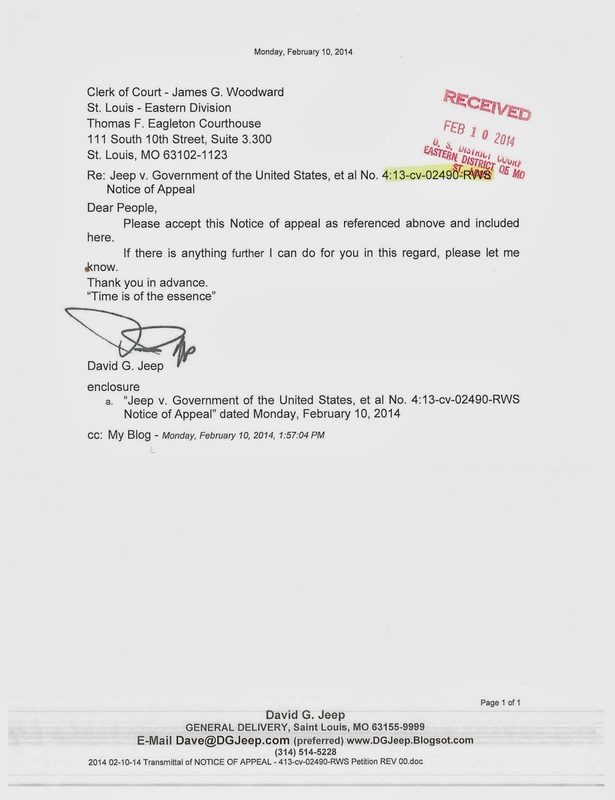 The unannounced appointment of John Andrew Ross District Judge on the United States District Court for the Eastern District of Missouri without prior LEGAL notice to the petitioner? 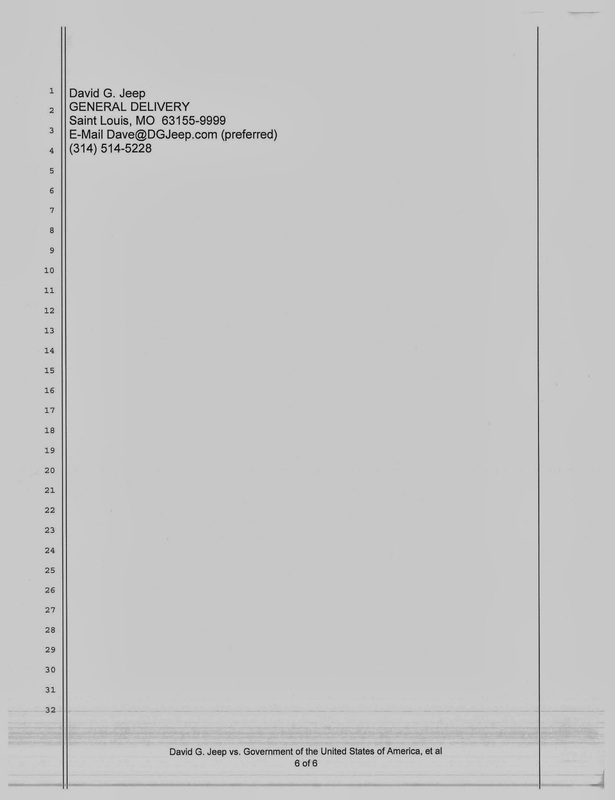 I make special NOTE that John Andrew Ross was a judicial member of the 21st District State Court of Missouri in 2003 when my Civil Rights were deprived by his THEN employee Commissioner Philip E. Jones, Sr. John Andrew Ross thus has at least a portion of the respondeat superior liability for his employee’s actions. 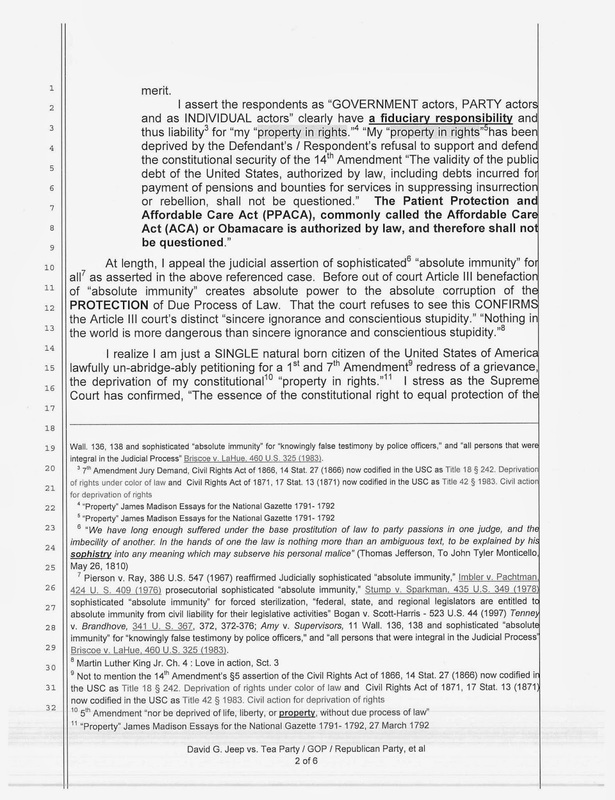 I currently have an action before the Federal Court, Jeep v. Government of the United States, et al No. 4:13-cv-02490-RWS, confirming and asserting this deprivation. 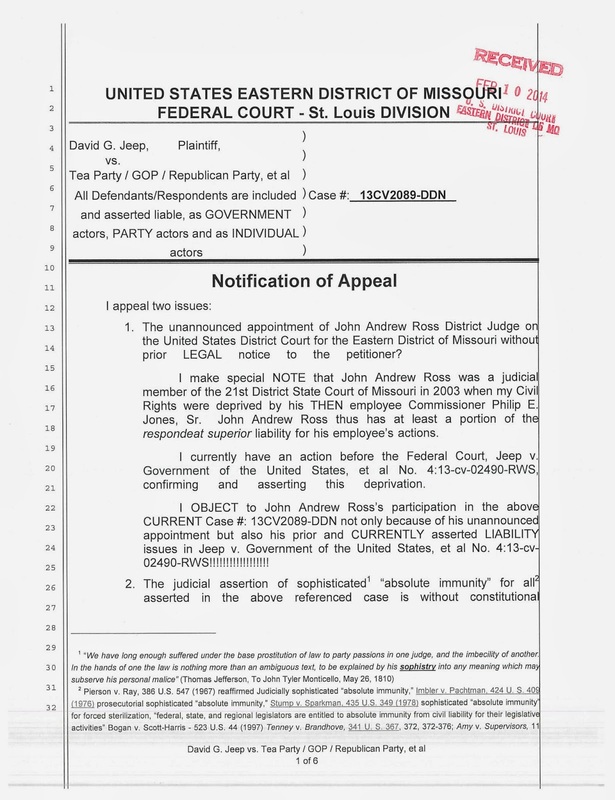 I OBJECT to John Andrew Ross’s participation in the above CURRENT Case #: 13CV2089-DDN not only because of his unannounced appointment but also his prior and CURRENTLY asserted LIABILITY issues in Jeep v. Government of the United States, et al No. 4:13-cv-02490-RWS!!!!!!!!!!!!!!!!!! 2. The judicial assertion of sophisticated “absolute immunity” for all asserted in the above referenced case is without constitutional merit. I realize I am just a SINGLE natural born citizen of the United States of America lawfully un-abridge-ably petitioning for a 1st and 7th Amendment redress of a grievance, the deprivation of my constitutional “property in rights.” I stress as the Supreme Court has confirmed, “The essence of the constitutional right to equal protection of the law is that it is a personal one, and does not depend upon the number of persons affected” (McCabe v. Atchison, T. & S.F. Ry. Co., 235 U.S. 151 (1914)). 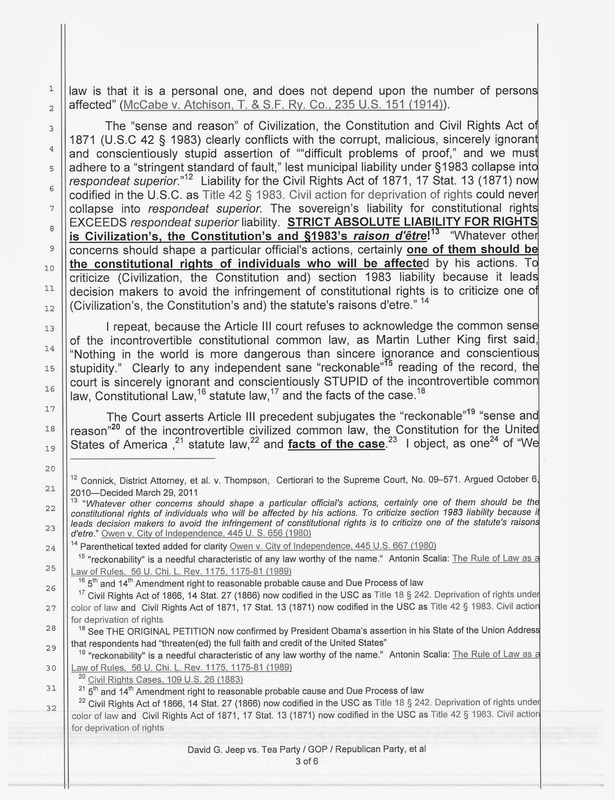 I repeat, because the Article III court refuses to acknowledge the common sense of the incontrovertible constitutional common law, as Martin Luther King first said, “Nothing in the world is more dangerous than sincere ignorance and conscientious stupidity.” Clearly to any independent sane “reckonable” reading of the record, the court is sincerely ignorant and conscientiously STUPID of the incontrovertible common law, Constitutional Law, statute law, and the facts of the case. 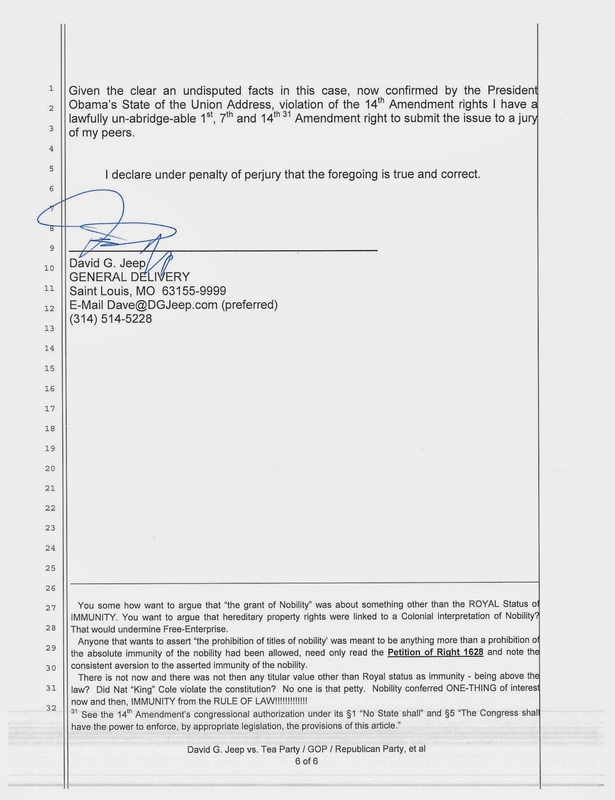 Given the clear an undisputed facts in this case, now confirmed by the President Obama’s State of the Union Address, violation of the 14th Amendment rights I have a lawfully un-abridge-able 1st, 7th and 14th  Amendment right to submit the issue to a jury of my peers.